Established in late 1859 by Captain James H. Carleton, 1st Dragoons, this desert post was located near Piute Springs in the foothills of the Piute Mountain range, about 25 miles west of Fort Mojave and 10 miles north of Goffs in San Bernardino County, a few miles west of the California-Nevada border Captain Carleton named the post Fort Beale for Lieutenant Edward F. Beale, U.S. Navy, who, in 1857-59, with his caravan of camels, explored the area for a wagon road. The fort, actually a subpost of Camp Cady, was one of a chain of military stations erected to protect the travel route from San Bernardino across the Mojave Desert to Fort Mojave. While the Piute post was misnomered a "fort," all the others were designated either "redoubt" or "camp," and all were strategically situated near sources of water. During the years of the Civil War, the posts were garrisoned by elements of the California Volunteers and evacuated at the end of the war. But local protests, stressing the critical need for the travel route and increasing mining activity in western Arizona, compelled the reoccupation of the posts in 1866. 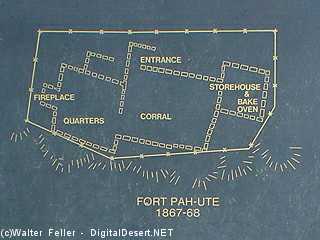 Upon reoccupation, the post was renamed Fort Piute or Fort Piute Hill, and was usually garrisoned by troops from Camp Cady, California. 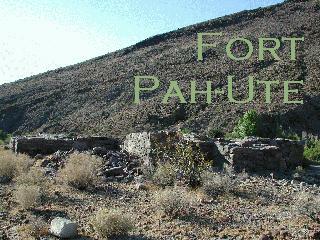 Fort Piute was abandoned sometime in 1868. Indian fights were common enough around Western forts, but not many of them could claim one that involved three tribes and not a single white man. 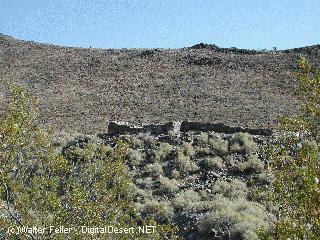 This was the case in the vicinity of Fort Piute, if local legend is to be believed. Apparently the battle started when a party of Piutes were attacked in their traditional hunting grounds by a larger group of Navajos. Included in the observers drawn by the clatter were several Apache scouts. One of them hustled off to his main camp and led his cohorts back to the battle area. When it appeared that things were quieting down with the Navajos the winners, the Apaches moved in and claimed victory over both tribes. The story continues that a resultant peace treaty between the tribes restricted the right to eat meat to the Apaches. It prohibited the Piutes from eating anything but fish. The Navajos were permitted any diet they desired so long as it did not include meat. Supposedly this tradition still is observed-but no restraunteer in the desert area will vouch for it! Fighting among themselves should not be construed to mean that the Indians did not fight the white trespassers in the Piute area. Only 22 miles west of the Colorado River and on the flank of but once removed from that of the river, the Piute area was considered their personal property of the Native Americans. Its planted and irrigated fields were commented upon in the report of the Whipple Expedition of 1854. Colonel William Hoffman passed through the site and probably watered at its spring in 1859. It was not far from Piute that he was harassed by the Indians and finally discouraged pursuit by firing on them. Although he had only half of his 60-some men shoot, the range was so close that he estimated 20 Indians were dropped. 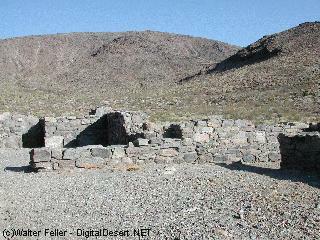 When the then Major Carleton established his chain of desert redoubts in 1859 and 1860, the first one west of Fort Mojave was what Carleton named Fort Beale. This was in honor of Edward Fitzgerald Beale, the ex-Naval officer who was involved in the camel experiment and whose charges passed the place in 1857. Rock with which the area abounds was used in building the fort. Ground remains indicate at least three buildings or units were erected, the largest being a main building of several rooms. Measuring 60 feet long by 25 feet wide, it included rifle ports in the thick walls, deflecting shields in front of each door to prevent direct fire through the opening, and rock breastworks at strategic locations immediately outside. 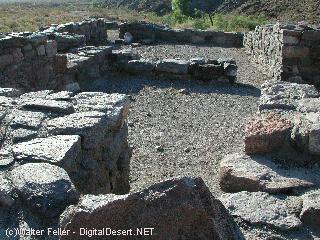 There was a rock corral and a rock walkway to protect persons moving between the main building and the corral. Another building, considerably smaller, may have been for a sentry or a cannon or as a shelter for users of the spring-the main reason for the host's existence. The water was cool and fast flowing within the canyon where it formed the creek if it was swallowed up by a thirsty desert within half a mile. This was a lifesaver for the Price Expedition in 1864. Fielded with orders to find the best supply route for Salt Lake City, Captain George F. Price had suffered many reverses in crossing the rough desert terrain. His mules had worn out, cavalrymen and their horses were hitched to the wagons, and he found the desert wells dry. By the time he reached the Piute vicinity, half of his men were barefoot. Only 20 of the original 89 horses and mules were serviceable. More would have given out had they not been able to quench their thirst earlier at Government Holes, and then drink their fill at Piute. Fort Beale was abandoned during the Civil War but was outposted frequently. The Indians continued to consider it their property, taking with impunity whatever happened to pass through. In 1864, two incidents were reported of Piute Creek Indians making off with settlers' stock. In the second case, the stolen cattle did not go far; they were slaughtered nearby. "A part of the meat had been taken away, and a piece of Indian arrow was found near the horse-fresh tracks were found near the camp," a citizen reported. 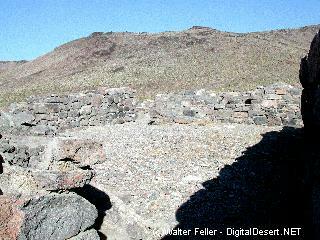 When the Army returned after the war, Beale became Fort Piute. In reality, it never had an official status, other than as an outpost of Fort Mojave. 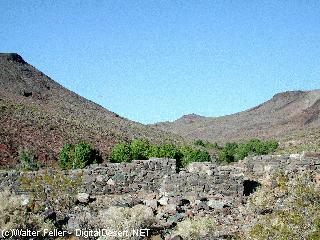 Under the name "Piute Springs" it also was a relay station where the Overland Mail changed horses. When Brigadier James T. Rusling passed it in 1866, he made no mention of any military outpost in the rock buildings. In Across America he did have critical comments to make on the area. "Pai-Ute bill, so-called . . . is really a sharp and ugly little mountain up which we toiled slowly and wearily ... It was a wild and desolate canon, barren and rocky, miles away from every human habitation," he wrote. It may be that his impressions of the place were colored, however. In rounding a turn in the road, one of the ambulances which had served him for thousands of miles in his inspection tour of posts, struck a rock. "There could hardly have been a more thorough collapse of spokes and felloes, everything seemed to go to pieces, and it could hardly have occurred in a worse place," was how he summed up his stop in Piute Canyon. Rock picket posts surrounded Fort Piute from between 50 and 100 yards away, covering entrances into canyon and approaches to crest. 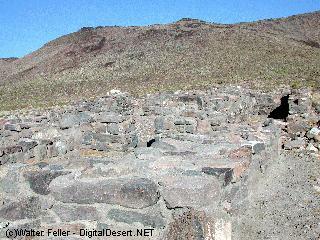 In this view of general area from corral, corral wall can be seen in foreground; main building of fort is in center, virtually camouflaged by its blending in with surroundings; crest of hill in rear suggests at least one rock outpost, right center. Outpost is about 3,080 feet altitude and has views of California, Nevada and Arizona.